I thought old BS was on vacation, but he still has minions putting out babble. “Our” job is to take care of you. Tell me what this means, please. Are older (whatever that means) workers stupid? Should they just look to the government for security? Are older workers unable to save and plan for retirement during forty or more years of working? How much money do you need to retire with dignity? 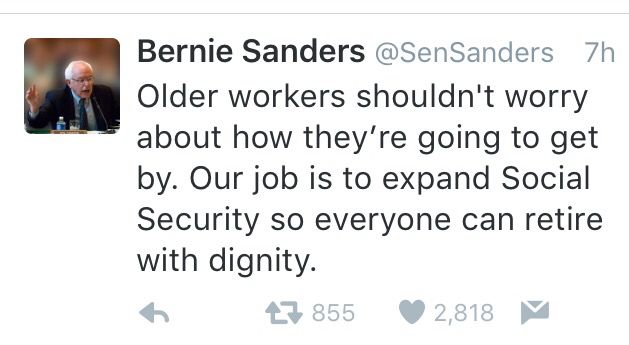 How much money does it take to live with dignity while you are working? Does dignity mean 100% or more of what you earned while working? Social Security provides on average 40% replacement of average pre-retirement income (not final earnings before retirement). Are we saying it should be 60%, 80% or more? From my perspective this type of poorly defined glib statement is very dangerous. And equally dangerous is the philosophy it represents; don’t worry, don’t take responsibility, government will take care of you. I also find this point of view insulting and demeaning to Americans. I do not find this point of view insulting and demeaning to Americans. I would label it as wishful thinking. I wish I could have a million dollars too and who wouldn’t want a million dollars. The only difference is that each day we are moving closer and closer to being enslaved by the government as a result of vote buying by the politicians with their promises. Sometimes they deliver on those promises such as Obamacare, if you call adding a poorly thought out new government program that will cost trillions. There is a great divide between the Haves and Have-nots. The media, Mason Avenue, the politicians like to point out the Have-nots should get what the Haves earned with the aid of government at no cost to them. Another problem is that the Haves are starting to believe that they are really Have-nots because they can’t keep up with the Jones and they are not the 1%. People want to believe so much that they do not realize that they are the Haves and will be taxed to death to pay for it all. When the day of reckoning comes everybody will be shocked like they were in Greece. As I approach Social Security, it is hard to resist not asking for more benefits. If I get them fine, if not, fine. I’ll be dead when my grandson’s generation stops paying the bill. Selfishness and greed are the signs of the time. But seriously I would be okay if they return Social Security back to the program that it was intended to be, keeping housewives from starving in the streets. The wife would spend 8-10 hours a day cooking at home because there were not instant frozen foods and microwaves. Bread was baked every day. Providing for a family pre-World War II was a fulltime job in a much different way than it is today.